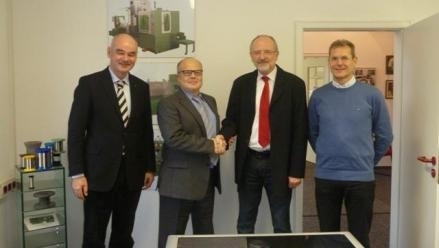 NIEHOFF ENDEX North America INC. (NENA), a subsidiary of Maschinenfabrik NIEHOFF GmbH & Co. KG, together with SCHMIDT MASCHINENBAU GmbH (SCHMIDT), are pleased to announce that the two companies have reached an agreement whereby NENA assumes full representation of the SCHMIDT equipment portfolio in North and Central America. The machine programs of NIEHOFF and SCHMIDT complement each other thus ensuring a highperformance and competent representation for machinery, spare parts needs and service requirements. Under this agreement, that went into effect on January 1st 2013, NENA acts as the manufacturer’s sole representative for the Sales & Marketing of new SCHMIDT equipment in North America. NENA will also assume responsibility for the spare parts supply, and service for all existing and future SCHMIDT customers’ equipment. SCHMIDT MASCHINENBAU GMBH is a specialized manufacturer for wet drawing machines, slip free drawing machines, spoolers, automatic spoolers and rewinding machines for steel, stainless steel, nonferrous metals and precious metals. The SCHMIDT Company enjoys worldwide recognition as a trusted partner and is highly competent with 80 years’ experience. Know how, design, manufacturing and service paired with great flexibility in terms of customer requirements makes SCHMIDT a trusted partner in the wire industry. SCHMIDT has 30 employees and is located not far from Dusseldorf in Gummersbach, Germany. NENA has been serving the North American wire and cable market for more than 28 years and employs 30 people in its Swedesboro NJ facility. NENA & SCHMIDT promise to work together to offer you an excellent sales & service experience and to provide solutions to your equipment requirements and needs. Lisa Lent, Sales Administrative L.Lent@NiehoffEndex.com (+856.803.1809) or to your NENA Account Sales Manager. For Service & Support, call 856.467.4884 and ask for your Account’s Customer Service Representative.